Our favorite free VST compressor plugin, a punchy compressor that makes wonders on individual instruments and voices. All the classic series plugins are worthwile! 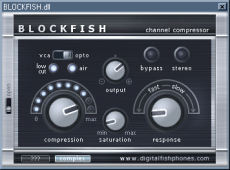 The digitalfishphones VST compressor "Blockfish" is a good old VST that still rules today. Don't forget to switch to advanced panel for more parameters to tweak. Unlike reaper, this plug is actually worth a few bux. can use the plug, then use additional filters to remove background whine. Big "thumbs up" to this plug and to the developer for making the plug(s) available for free. don\'t touch reaper. thank your god for reaper being there. 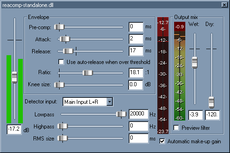 The VST version of the reacomp compressor coming with Reaper. You can use a filtered input to trigger the compression. Very good and a clean interface. the best free vst compressor has a lot features very customize! a must have... but needs to really know how to use a compressor. more of a studio tool than musician tool.